Dressing for an interview is one of the problems we face while we are going to attend an interview. Every office may have a different kind of attire trending on or certain kind of dress, may be casual, classic or formal. The first concern is what to wear in an interview to impress the jury members or the interviewer. One must look confident and smart when going for an interview but the problem is many have their own choice of attire they want to wear, so there is a bit of confusion of what to wear and what not to. The startup is a young company which provides the products or items which are not available elsewhere. They are the companies that got recently started and thus they need more working people. Their whole focus is on getting better than before so of course, they would prefer a good candidate for their post. So by this, we can deduce that these companies will opt for a formal wear as its main work is to interact with other people. The employees of these companies need to be a smart, diplomatic, sharp and calm person. So the person who is going to give an interview in this organization must have these qualities if they want to attract the people taking his/her interview. 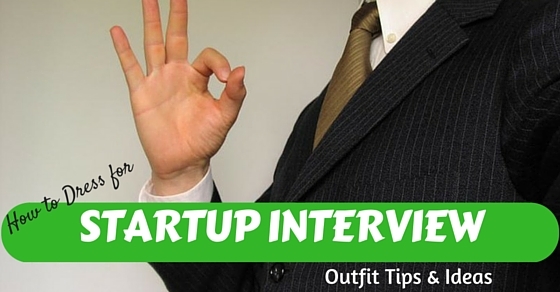 What to Wear to an Interview at a Startup? To go according to your desire or to wear to impress others. Of course many will think the second one as the answer and it is somewhat true. The first look will be the first and last impression and of course it must be a good one. The way you dress tells your personality. If someone wants to dress up for a startup interview he/she must know the type of association or place it is and should dress accordingly. We don’t have the choice of clothes those jury members would prefer but it is good to be prepared and to be on a safe side. To impress them and look good and smart, try these steps. We should always keep in mind that if we are going on an interview we must look fresh and clean. Nobody looks good and charming with dirt on his/her face. We should take a proper bath and should always wear clean clothes. This will help us not to stink before them. If the person is clean, he/she feels confident and happy. If we don’t take care of our hygiene even we won’t be able to concentrate on the interview. Feeling fresh and looking clean is one of the essential things we should do before going on an interview. A clean and attractive candidate is a good option anyways. Of course, if the person can’t keep himself clean how will he able to run the company with a tidy and calm mind. These things matter the most during an interview. Of course our hair also plays a vital role during an interview. The way the person style his/her hair shows off his/her personality. One must wash their hair and dry it. Women shouldn’t use too much hair accessories and a man shouldn’t apply gel or anything else. A man shouldn’t spike his hair as its looks too casual. Try and keep the hair down. Ladies should have a good haircut and should either let their hair down or should tie in a high pony. Men should shave all their facial hair as it looks more professional. Smelling good during an interview is a good option. That’s a very obvious thing that nobody wants to smell someone’s sweat or body odour especially the person taking your interview. Men should avoid heavy aftershaves or cologne. Too much of a strong smell is not so good. A light one will do. Women should also use light perfumes with a fresh scent. Be sure not to overdo it. Keep it soft and sweet. Don’t chew mint candy or chewing gum during the interview. Use a mint spray if it’s necessary. The person should trim their nails before going for an interview. Of course the first thing, one will do is to shake hands with them. So make sure that it’s proper as they pay attention to each and every single detail. If the female candidate doesn’t want to, then she should clean her nails properly, manicure it, shape it and should polish it with a light and subtle colour. Make sure that the colour is not loud as it’s not so good. The edges in of nails shouldn’t be sharp. Make sure that your attire looks professional. It shouldn’t be too much casual as it hinders your overall professionalism if you are in a business field. Casual wear is for casual purposes but formals are needed when we are interacting with new peoples and having some important discussion. As this kind of dress makes the person look more diplomatic and fitting for your job. As in interview, your look is most important. The candidate for the interview must look fitting for the job. Men should wear a dark colored suit or a shirt with pants with a necktie. Make sure the neck tie is properly knotted. It shouldn’t be loose. Although wearing something of darker shade can be a headache during summers. But if you want to maintain certain standard, you have to. You can have your preference on material though. Women should wear a work attire like a suit or suit with a pencil skirt up to her knees. She can also wear a dress but it should look professional and not casual. Casuals can deeply harm one’s reputation and impression. Women can wear what they want but for an interview, they shouldn’t be under dressed. If the work to be done is a casual one, as in working on a construction site or lawn area, wearing these heavy clothes won’t be a good idea. Wearing something light and work type is the best. Wearing casual cotton clothes is appropriate if you want to survive in the outer world. If it’s confusing what to wear then always remain on the safe side and wear a professional dress. For men cotton khaki pants or long sleeved cotton t-shirt is good. And for women, normal cotton dresses would be a fine choice. Make sure it’s not too casual. It should have a hint of professionalism. But still being on a better side is a good choice. If the company has some problems of wearing a casual, don’t do so. Before wearing anything have a glimpse of the company. See what kind of clothes the employees prefer. You must wear similar clothes as they are already working in those agencies and they know the good and better of the organization. Follow what kind of style, casual or formal they are wearing. As a newcomer follow the trend which is currently going on in the office. And then prepare yourself for the interview to put a lasting impression in interviewer’s mind. Of course, if the employee can think of something which is more innovative in their way then it’s good. But always follow the rules. Always wear a shirt in a business or formal environment which should be ironed and should have a mild colour. It shouldn’t be too flashy or funky. A simple one with a matching tie is a good idea. The tie should also be a subtle one. Don’t overdo your top. As for women they can also wear a shirt with a proper matching pencil skirt if possible. If going for a casual business meeting, jeans and a pretty top or a nice dress would look fine. Women shouldn’t wear see through top as it doesn’t look appropriate. And don’t show off cleavage. it’s too distracting we all know. It will look either too seducing or too tacky. Bra straps or too much skin on view is not a good idea either. Do have a good and confident posture while sitting. Pants are the fittest bottom attire one can choose for an interview. Jeans are too casual for it. Wear dark colored matching pants. It should look good in pair with the shirt the candidate is wearing. It should be well ironed and should be of proper length. The ankles shouldn’t be peeking out of the end. It’s a professional interview and this cloth is too simple and casual for it. Women should also wear pencil skirt just above their knees or below. A dark colored one is the most appropriate one. A light top with a dark skirt or pant will look good and professional. The skirt or bottom wear should be comfortable to wear and to sit down. It shouldn’t be too tight or fitting as it would look a little odd especially if you are little healthy or fat. Too many legs on view aren’t good either. Always wear clean and spotless shining shoes and a new one for the best impression. The shoe must be a dark colored formal one made of leather and properly polished. It should match the attire and should be appropriate according to the culture. The socks should be subtle one and not outrageous. It should match with the colour of the pants or must be the same shade as when sitting cross-legged it will peek out a little and would look odd if of a different colour. Women should wear high heels without showing off the toes. It should be a new one with a solid colour matching the outfit. Check if the heels aren’t dirt clinging to it. Men and women should preferably take minimum accessories if possible. A good watch, gold or silver would be fine. it shouldn’t be flashy and should match with the outfit. Black leather belt with silver buckle looks good. Women should also have a purse matching with their outfit and not too outrageous. Jewellery should be minimum like a small chain or pendant with a small locket would be fine. It should look classy, not tacky. Don’t show-off too many piercings if possible. The face is the first thing the employers will see while you walk in. Make sure it looks good. Men should facewash before the interview so as to look fresh and clean. Too much sweat on the face isn’t pleasing. Women should also wear light makeup and should look fresh and clean. A little eye makeup like eyeliner with a subtle eyeshadow with mascara would look fine. Apply a light colour lipstick and not too showy one. Too heavy makeup is not preferred as it would not impress the employers so much. Following these steps will help you to make yourself look presentable before the people. One must look cool and formal in front of those people who are going to hire them. Too much of tacky appearance will make them dislike you and too much casual one will make them think of very lightly or a lazy person. If you can’t spend time on your looks much and make yourself fine then it’s quite impossible for them to accept you as they want you to take everything seriously including your appearance. Our hygiene comes first and then total appearance with our outfit. The fine look in our eyes and a will power to achieve what you want will be the best thing to add. Always be good and respectful while talking and it would impress those people around. Have a good posture.